In my previous post I used XMLTABLE and ora:tokenize to split a comma delimited string. Now I’ll apply that technique to multiple rows, and show that it’s faster than other methods. In my tests, I configure the length of the substring, the number of substrings per row and the total number of rows I should get as output. Each input string is unique because it starts with the ID of the row: this way I avoid any caching that might reduce the number of function calls. Notice the CACHE keyword when I create the table. Before my tests, I access the entire table to make sure it is all in the buffer cache. This is the technique from my “New, Improved IN Lists” post. All I need to do is apply it to multiple rows. [Update 2016-08-02: in a comment, Todd Hershiser points out that the second parameter in ora:tokenize is a regex expression. In order to use a regex “metacharacter” like “|” as a delimiter, I need to escape it with a backslash. I decided to put the backslash in everywhere since it doesn’t do any harm. This technique is fairly popular, no doubt because it is concise. For multiple rows, I use the “CONNECT BY ... 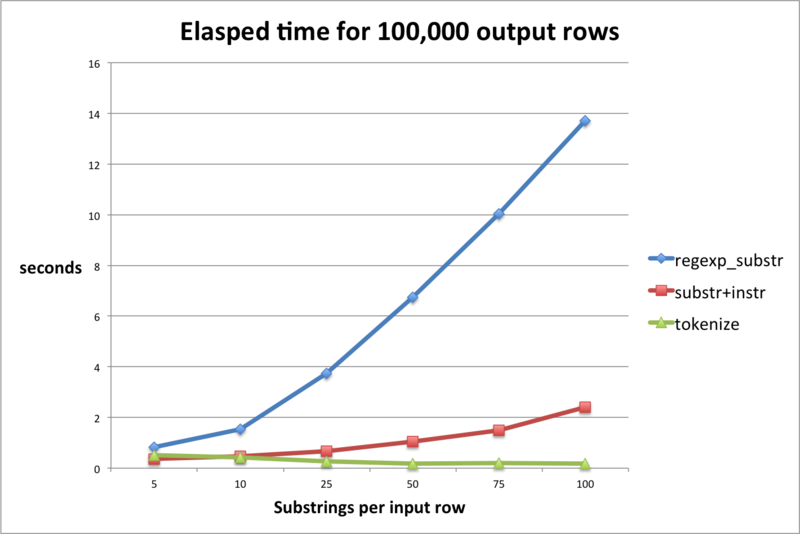 PRIOR SYS_GUID()” technique that I explained in Chunking tables 7: prior sys_guid(). As you can see here, the “substr+instr” solution is slightly better than “tokenize” when there are fewer than 8 substrings per string. As the number of substrings increases, the “tokenize” solution scales much better. As for the “regexp_substr” solution, it is on average 20 times slower than “tokenize”. This entry was posted in SQL and PL/SQL Utilities and tagged split strings, SQL. Bookmark the permalink. Fascinating stuff, Stew! I suggest you add these different approaches to LiveSQL.oracle.com. Also, I’d love to do a PL/SQL quiz offering these variants. I will credit you with the implementations. Does that sound OK? Thanks, Steven! Good idea about livesql, will do. Of course use anything you want, my pleasure. Interesting comparisons, but I find the tokenize approach to be more than 10x slower than the old standby method (I think from Tom Kyte) that just does string parsing. The tokenize approach also chokes on some of the very common delimiters such as the pipe symbol because of the regex going on under the hood. Thanks for this peer review. Could you post your test code so I can confirm your results? You don’t say how you do multiple rows with the “Tom Kyte” approach. P.S. I have tested the published “Tom Kyte” solution from his blog, using both the LATERAL() technique and the CONNECT BY technique to extend it to multiple rows. It is always a bit slower than the “substr-instr” solution I tested in this post. As for the “pipe” and other metacharacters, you are right and I am happy you pointed out that problem. The solution is very simple and I have updated my blog post to include it. My initial testing was iterating through your 20K table and calling a function on each row to take the delimited list and return a SQL type (table of varchar2(255)). This is where I was seeing a 10+x difference. Here, I see a 2-3x performance difference on average between the two with the tokenize consistently taking longer – and it doesn’t even have to do a context switch. The parsing approach does have, as you pointed out, the 4K limitation, although in most cases I wouldn’t see that a blocker. Let me know if I’m missing something here or am not comparing correctly. In any case, this is interesting to me because we are always having to do this type of delimited value to row transformation and I appreciate your thorough coverage of this topic!